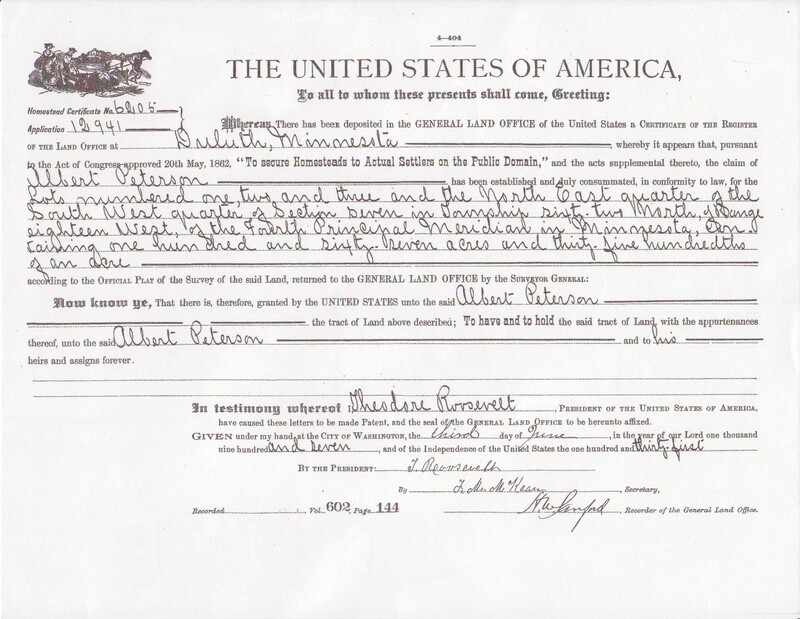 It looks like Great Grandma Augusta Peterson came to Tower, MN from Sweden in 1888 as a servant girl. 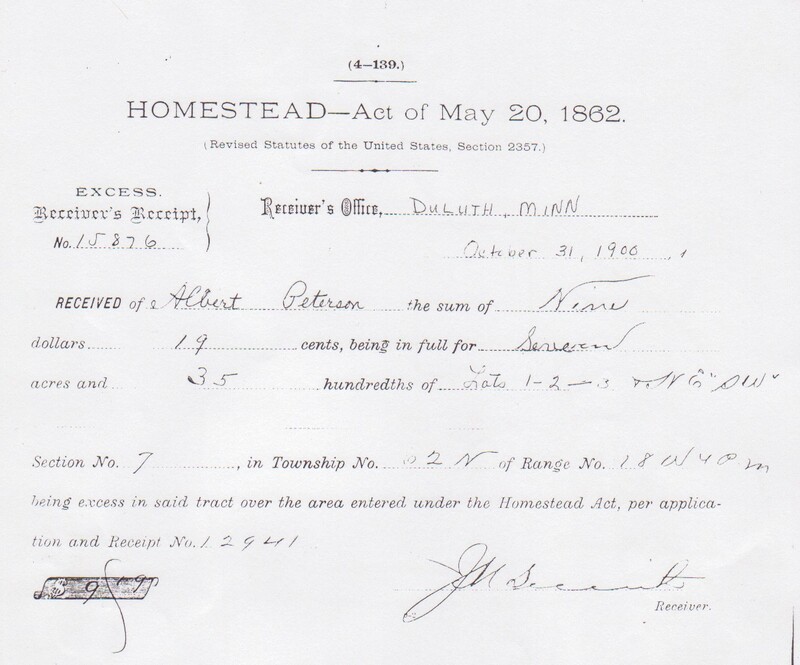 He began to work this land under the Homestead Act, clearing fields and using the logs to build first a shanty and barns and then the house that still stands today (barely). 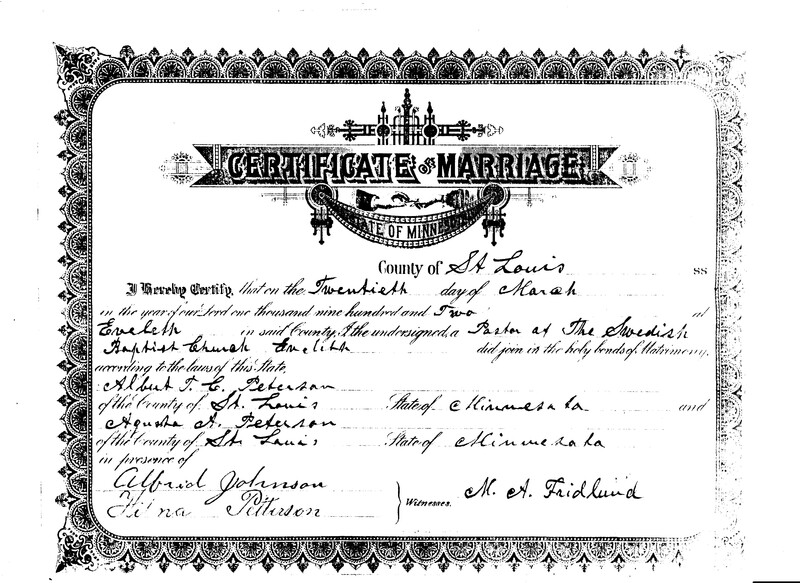 On March 20th, 1902, Augusta Peterson and Albert Peterson were married in Eveleth, MN by a Swedish Baptist minister. No, they were not related. In Sweden, Peterson means Peter’s Son. Lots of Peters and Johns, etc. Makes genealogy interesting. I don’t know if this was really signed by Teddy Roosevelt or by one of his minions, but I like to think he held this piece of paper and signed his name to it. After 7 years of hard labor, (and $9.19) it was theirs. By then he and Great Grandma Augusta had been married 5 years. For years, people of the Cook area would visit The Farm for church picnics and the like. Before Cook had an airport, the hayfield even served as a landing strip. While getting ready for the reunion, we were touched by how many people fondly remembered the farm from their childhoods. It wasn’t just OUR happy place, it was theirs, too. Now, my sister and her husband live in the house our Great Grandparents built. Many of the building are still standing: the barn, woodshed/ice house, machine shed, outhouse (now in a new location in the yard, serving as an adorable potting shed) and garage. The Farm has become The Funny Farm, home to a motley herd including three mini ponies, two donkeys, two llamas, a sheep, a goat, two alpacas, three bunnies, four dogs, a cat and a cockatiel. And two Guinea Monsters From Hell. Sort of. They have been on the lam, harassing me and other neighbors since Lois brought them home. If you have any pictures or stories about The Farm, please let us know! What a great story!! I too have roots in Sweden. My great grandfather was a Swan and therefore his son (my grandfather) was Swanson (the son of Swan) but when he joined the Army there were so many Swanson’s he changed his name to Lundgren (Swedish, but not as many of them) and we became the Lundgren clan. When I was doing research for our township for their centennial it was so fascinating all the history! I loved it. And what a tremendous blessing that you live in an original homestead. A founding of this area. Major wow. I always enjoy your posts Laura!